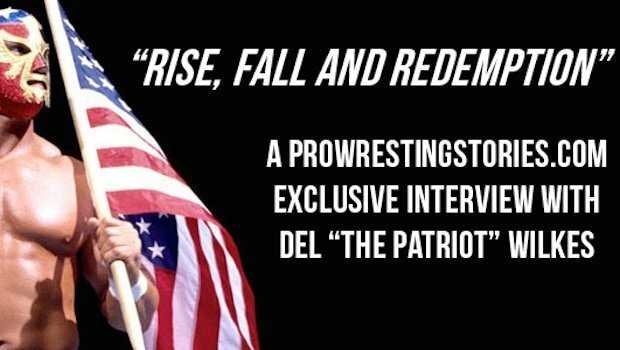 Pro Wrestling Stories.com had the privilege of catching up with Del ‘The Patriot‘ Wilkes (@DELWILKES). In our in-depth discussion, Del held nothing back! Wilkes played college football as a linebacker for South Carolina and had a short stint in the NFL before turning to professional wrestling. Del talks training to wrestle with The Fabulous Moolah, wrestling for Mid-South Wrestling, AWA, GWF, All Japan, WCW and WWF while feuding with and alongside Scott Steiner, Buff Bagwell, Kenta Kobashi, ‘Dr Death’ Steve Williams, Stan Hansen, Vader, Bret Hart & The Hart Foundation and many others. 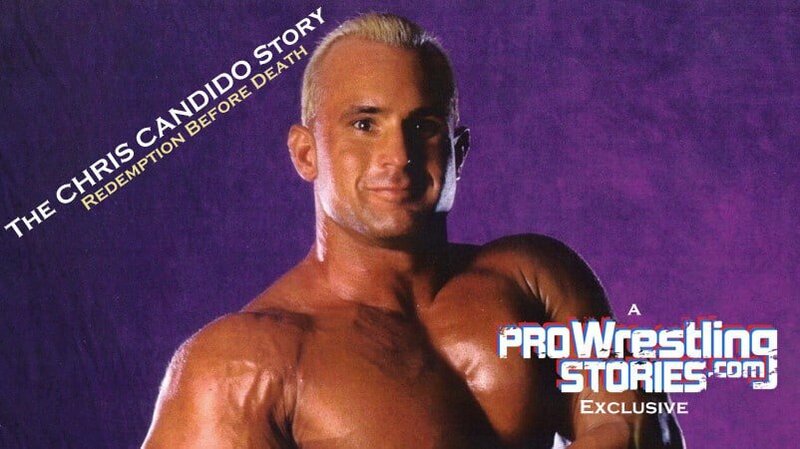 Del shares a funny story about Scott Steiner, the cliquish stronghold Hogan, Savage and Flair had in the WCW locker room, the uneasiness behind the curtain in WWF as tensions grew between Bret Hart and Shawn Michaels, Vince’s dislike of masks, the pride of fighting for Baba at All Japan, the Japanese audience, his 200+ pills-a-day addiction, his view of the current product, advice to wrestlers coming up in the business today, plus much more. The Patriot since found redemption cleaned himself up, found God, has a 3-disc DVD set (now out!) and has an inspirational story to tell. Pro Wrestling Stories: Del, it’s an absolute pleasure talking to you today. You have a storied career spanning over ten years and quite an inspiring story to share. Thanks for taking the time to talk with Pro Wrestling Stories. Del Wilkes: Well, I appreciate you having me. PWS: So let’s go back. 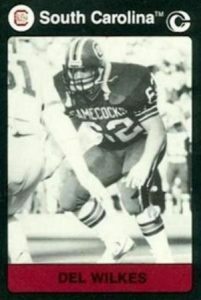 You played college football at South Carolina for four years from 1980-1984 as a dominant lineman, had a short stint in the NFL and then turned to professional wrestling. What inspired you to train to become a wrestler and what was it like training under the tutelage of The Fabulous Moolah? Del: I grew up a wrestling fan here in Columbia, South Carolina. Watched every Saturday as a kid growing up in Columbia and I just fell in love with wrestling. I determined in my freshmen year at South Carolina that whenever football was over for me, I was going to pursue a career in professional wrestling. The Atlanta Falcons released me prior to the start of the 1986 football season, so I came back to Columbia and I gathered up my money. I think it cost me $1800 then to get through Moolah’s school. Of course, it was neat meeting and getting to know Moolah. Obviously, as a wrestling fan, I knew of her. I knew all about her but never met her. I knew she was from my hometown, but just to have the opportunity to sit around and talk with Moolah, hear some of the stories about her years in the business and who she was. That was really one of the huge iconic woman figures of all time. Back when she broke into the business, there weren’t many women in the business, so she was somewhat of a trailblazer. She was tough! She had to be tough at that point in time to make a living in a business that was dominated by men, especially when she broke in back in the 50’s. So, it was really neat to be around her and get to know her. She was tough. She had a tough reputation and she was. She was a tough businesswoman as well, but she had a sweetness about her. I enjoyed her friendship up until the day she died. PWS: The first territory you began wrestling for was with Jerry Jarrett’s Mid-South Wrestling. You wrestled under the name ‘Del Wilkes’ and became the ‘Dream Weaver’ soon later. You were then put under a white hood and paired with Scott Steiner to become ‘The Wrestling Machine’. Steiner has always been a favorite amongst fans online due to the unorthodox way he’s conducted interviews over the years. What was it like working with him and do you have any stories to share about Steiner? Del: I enjoyed working with Scott. Scott and I have always been good friends and I still see him at a lot of the personal appearances we do. I’ve always had a good relationship with Scott and a real good friendship with him. It was interesting being out on the road with him back then. Working for [Mid-South Wrestling] back then, there was a lot of good talent there. There was Scott, myself, there was Tracy Smothers, Brian Lee, Mark [Callaway], and this was way before the Undertaker days, Sid Vicious. And I don’t know if this was by necessity or if it was just Scott’s nature, but we weren’t making much money, hardly any money at all. It was interesting to watch Scott function out on the road. All of us would go in to get a buffet because we knew we could eat an awful lot for just a few bucks, and Scott never would pay for the buffet. He would just eat off our plates! He would just let us pay for the buffet and put things on our plates, so he was good at being able to stretch a dollar and make a dollar go a long way. Heck, we were all starving at that point in time, making very little money and doing an awful lot of driving to make that little money. But it was fun. We didn’t know any better. We had a dream and we were chasing the dream together. It was fun being out on the road and making those necessary sacrifices. 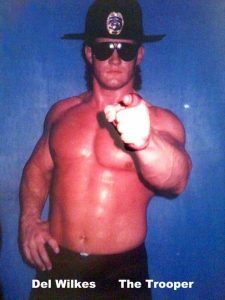 PWS: You later wrestled in the AWA as ‘The Trooper’ and in 1991 moved on to the Global Wrestling Federation where you unveiled ‘The Patriot’ persona for the first time. 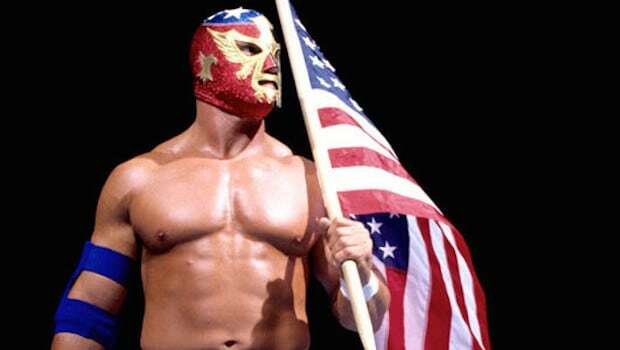 Where did you get the idea for becoming ‘The Patriot’ and what was it like working under a mask for the first time? I said, “I’m in.” I thought it would be a good idea as well. That night when I walked down the aisle at the Sportatorium, that building erupted. Those people let me know that we were on to something good. You asked what it was like working in a mask. As you had mentioned before, I had worked under a hood as ‘The Dream Weaver’ and as ‘The Wrestling Machines’, so it wasn’t necessarily foreign to me. But, I hadn’t done it in a while so it took a little getting used to. You had some limitations on your vision, especially your peripheral vision, but after a few times of doing it, other than it being extremely hot, I got used to it. 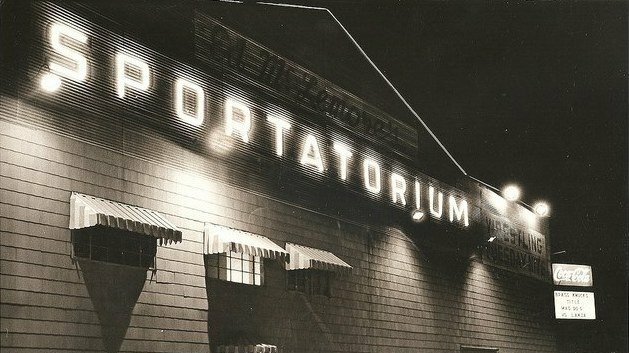 PWS: The Sportatorium was quite the storied venue. It’s a shame it’s not around anymore! THE PATRIOT: Yeah. You know, not only from a wrestling standpoint but when you think of all the musical stars that went through there. Elvis, when he first hit the road back in the mid to late 50’s, he frequented the Sportatorium. If those walls could have talked, man, they had stories to tell. PWS: You wrestled many years overseas including a few stints over at All Japan. How was your All-American, fan favorite ‘The Patriot’ persona received overseas? THE PATRIOT: It was received very well! Working for Baba’s company, All Japan, there wasn’t a heel/babyface angle or anything. There were Japanese guys that the Japanese fans would boo and there were American guys that Japanese fans would applaud. But our style of work was different. There were no heels. There were no babyfaces. There were no double count-outs. There were no disqualifications. Every night, there would be somebody who would get their hand raised. There was a 1-2-3. That style of work, it doesn’t lend itself to a babyface/heel [dynamic], so I was greatly received by the Japanese fans. They were some of the most intelligent wrestling fans that there is. It was a privilege and a pleasure to work in front of them. They were phenomenal. PWS: You hear interviews of wrestlers who fought out in Japan talking about the way Japanese fans watch the matches. Their silence. THE PATRIOT: There were moments of silence, especially early in matches. You could put a series of moves together, come up from it, square off with each other and think, “Wow, we have something great here!” and you get no response or just a few scattered claps throughout the arena. But where they really get involved from the vocal standpoint, from stomping their feet, clapping their hands and jumping up and down, was the most important part of the match and that was the finishes. Our finishes were long. You know, we could have a 15-20 minute finish. So long as you can get them near the end, near the finish, that was the main thing and the most important thing. PWS: In ’94, you signed with WCW and formed a team with Buff Bagwell called ‘Stars and Stripes’. Tell me about your time in WCW. What was the pulse like in the locker room before you went over to WWF in ‘97? 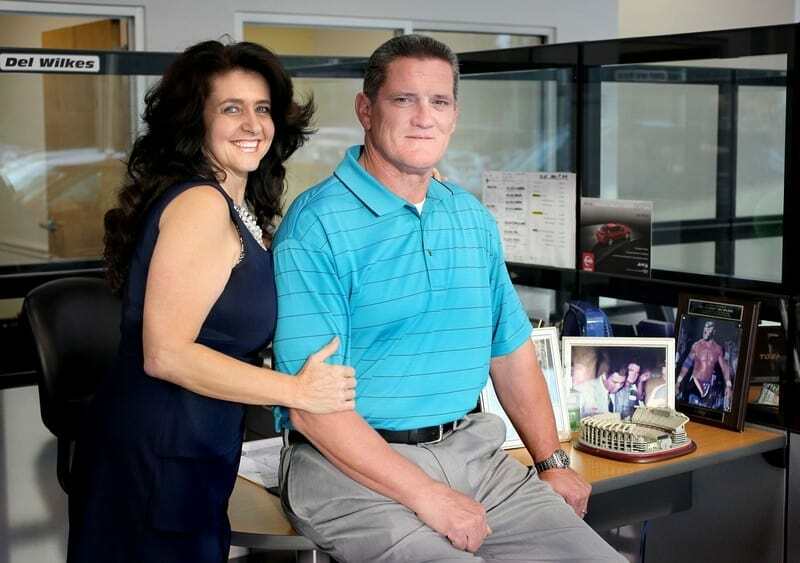 THE PATRIOT: I was at a point and time in my life with my children and my family where I wanted to get back home. I wanted to work in the States. Bischoff was now running WCW and I knew him from my AWA days. He was our TV guy that did our TV show. He was the voice of our TV show. Greg Gagne was also now working in WCW. He was one of the members of the booking committee and of course, he was very viable in the AWA. I knew those guys from my AWA days and that opened the door for me to get into WCW. WCW was a very cliquish company, especially after they brought Hogan and Savage in from the WWF. There were the friends of Hogan. There were the friends of Savage. There were the friends of Flair and there were the friends of ‘so and so’. It seemed like if you didn’t fit into one of those categories, you weren’t going to get pushed. When Hogan and Savage came in, the whole focus of the company changed. It was all about them. It was no longer about the guys that were there before then. I was ready for a change. I did not complete my three-year contract there. I walked out with about a year left to go. I actually went back to Japan before I went to the WWF. PWS: It’s such a shame that a lot of great wrestlers in WCW at the time got lost in the shuffle amongst the likes of Hogan, Savage and Flair who were pulling a bit of strings in the back. It must not have been the most enjoyable time. THE PATRIOT: No, no it wasn’t. I had already been in negotiations with Baba about going back to Japan and I went to Eric [Bischoff] and asked if he would let me out of the last year of my contract as I had a chance to go back to Japan. I told him that I would not be in direct competition with him. I would be working halfway around the world and nobody would see me except those who were in Japan. He wouldn’t let me out of the deal, so I just walked out and left. PWS: When you later got to WWF, you wrestled alongside Vader against the anti-American Hart Foundation. You also went on to have a feud against Bret Hart for the WWF title at the Ground Zero: In Your House pay per view. What was it like working with Bret Hart and Vader? THE PATRIOT: It was a lot like what I was accustomed to in Japan. Both guys worked very snug and had a lot stiffer style of work. Their work rate was certainly dictated upon the believability of what they did in the ring. They both were very serious about their work and to make it look as believable as possible. This lent itself to a little bit more of a snugger style of work, but I was accustomed to that being in Japan all those years. It worked perfectly for me. I had worked with Vader one time in WCW and now I was working with him in WWF. I enjoyed it. I enjoyed spending time with Leon [Vader] on the road and traveling with him. Then, of course, that segwayed into my program with Bret and the timing couldn’t have been better for it because he was on his anti-American campaign. And of course, here comes The Patriot dressed in red, white and blue waving a red, white and blue flag. It coupled up very well. PWS: It loaned itself up to that storyline perfectly. PWS: A lot of our readers have always been interested in hearing about the guys in the back. With the likes of Owen Hart, Davey Boy Smith and Curt Hennig around, there must have been a lot of hijinks happening behind the curtain! 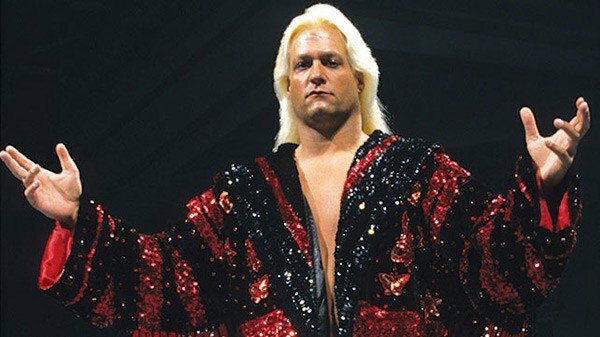 Do you have any good road or rib stories from your time in WWF? And who were your favorite guys to be around? Del: I had been around Hennig before back in the early 90’s when I worked several weeks worth of shots for Vince. I had spent time with Curt on the road and John Nord [The Barbarian]. Those guys were always funny and up to something no good. They were good ribbers, as was Owen. It was a good group of guys and it was a different atmosphere than it was in WCW. But, there was that growing division between Bret, Owen, Davey Boy and Neidhart with Shawn Michaels and his group of friends. That gulf was growing between Bret and Shawn and of course, it eventually lead to what it did lead to [with the Montreal Screwjob]. There was a lot of uneasiness a lot of times in the locker room because of the growing heat between those two guys and their difference of philosophies. But, for the most part, things were good there and I enjoyed my time there. PWS: After an unfortunate string of injuries to your triceps and knee, your time with WWF was cut short and you were released in early ‘98. Do you think the WWF had something more for you other than the handful of matches you had with them? Del: I do. When I first got there and first met with Vince about coming to work for him, he wasn’t convinced that at that time in the wrestling industry that a masked guy could get over. He didn’t mind expressing that to me and I didn’t mind expressing back to him that I disagreed with him. I did have allies in Jim Cornette, Jim Ross and Bruce Prichard. 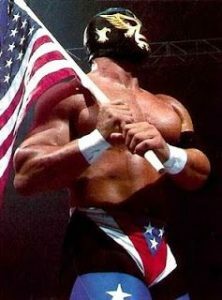 We had this character that could get over in Global, Japan, WCW and Vince had talked about maybe taking [The Patriot] mask off of me. But shortly thereafter, when he saw the kind of reactions that I was getting night after night and the wrestling fans no matter what city you were in, I think you convinced him that that character could and would get over. I think I could have had a long successful career there. But unfortunately, even before I got there, I had major, major injury issues. I knew- Nobody knows your body like you do. I knew because of the injuries and because of the limitations that I had in the ring, the pain that I was dealing with. I knew that I probably had very little chance of making it through the entire three-year contract I had with them. PWS: You popularized the entrance song ‘Medals’ during your tenure as The Patriot with WWF. Before your release, Sgt Slaughter used the song at December 1997’s ‘D-Generation X: In Your House’ pay-per-view. Kurt Angle, following his debut in ‘99, popularized the song again. Did it bother you that they used your entrance song on two guys before and soon after your release, or did you take it as somewhat of a compliment? THE PATRIOT: No, I take it as a compliment that they would use it again. I had no problem with them using it! I was done. I was no longer able to work. I was no longer a part of the company. You know, I’m just not wired that way. I took it as the exact opposite. Instead of it bothering me, I thought it to be a compliment that they used it for those guys. PWS: You have never been one to shy away from talking about past mistakes and the tough road you’ve been down, which is admirable and provides a lesson to those out there who might be struggling with the same addictions you once had. Before, during and after your wrestling career, drugs, steroids and prescription pain pills played a big role in your life. In interviews, you mentioned that there was a time you were taking over 100 prescription pills a day. And from 2002, you spent more than 10 months in prison. How did it get to this point and what was your wake up call? I had no knowledge of prescription pain medication at that point. But he sort of smartened me up on it, gave me a handful and said, “Look, try these before your match.” And I did and the pain went away. Now the injury didn’t go away, but the pain went away. I was able to go out and do what I was paid a lot of money to do, to go out and work and to provide for my family. This was my living. This paid my mortgage. It provided for my kids. It put a roof over our heads. So I’ve got to go out in spite of the injury, in spite of pain and work. Innocently enough, like I think it happened with a lot of the guys, you take [the pills] to work. You do what you’re paid to do. Over the course of the years, it grew into something much bigger, something that I could not control and something that literally took over my life. Those two pills before a match one night eventually lead to 100 and 120 pain pills in a day. Now, that didn’t include the other types of medication I was taking- sleeping pills, muscle relaxers, Xanax. So, when you add those two together, 120 pain pills in a day to the other pills I was taking, I was approaching 200 pills a day at this point in time. It had complete control of me. My life was just spiraling out of control. PWS: You’re lucky to be alive, especially with the amount of wrestlers who sadly lost their lives because of similar types of addiction. PWS: But the beautiful thing, though, is that you’re telling your story. People can hear this. There are others going down the same road you’ve been on. You’re a testament to how to turn it around. You’ve wrestled for Mid-South, AWA, Global Wrestling Federation, All Japan, WCW and WWF, feuding with and alongside Bagwell, Kenta Kobashi, Paul Orndoff, Stan Hansen, Harlem Heat, ‘Dr. Death’ Steve Williams, Vader, Bret Hart and many, many others. You’ve held over 7 belts across your career including the GWF North American Heavyweight Championship and the World Tag Team Championship with both AWA and WCW. What is the accomplishment from your career that you are most proud of? 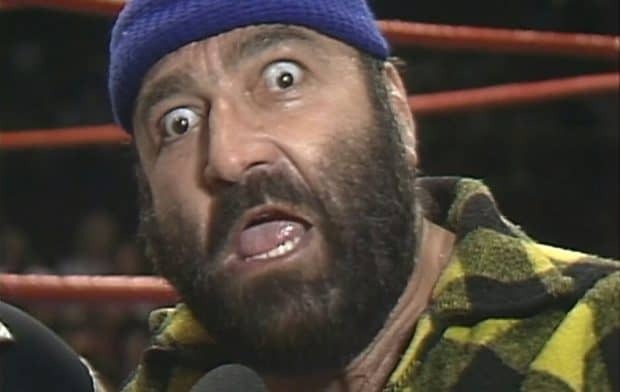 Del: To me, the highlight of my career- working with Bret in the WWF means a great deal to me, but to me, the crowning achievement of my career was to be able to work on that roster that Mr. Baba had in Japan, because he had an absolute hall-of-fame lineup of talent. For him to think enough of me to include me in that talent, that had Dr. Death Steve Williams, Terry Gordy, Abdullah The Butcher, Dory Funk Jr., Stan Hansen, Johnny Ace [John Laurinaitis], Doug Furnas, Danny Kroffat, The Fantastics [Bobby Fulton and Tommy Rogers], a guy that I partnered with for a while, Jackie Fulton. And then you go to the Japanese bus and there’s Baba, Jumbo Tsuruta, Kawada, Taue, Misawa, Akiyama and the greatest of all, Kobashi. To be a part of that line-up… it was a feather in your hat to be able to work for Baba full time. PWS: You used a Kickstarter campaign to help raise funds for the documentary you worked on with Michael Elliott called: “Del “The Patriot” Wilkes: The Man Behind The Mask.” You made a total of $5,915, which is a testament to how much the fans and your supporters want to see this project’s success. Tell us a bit about this DVD. THE PATRIOT: I was approached by Michael about a year ago about doing this and I was honored that he would want to do a documentary on not only my career but my life. It’s from birth to where I’m at today and everything in between. College football, high school football, pro wrestling, family, drug addiction, redemption, overcoming those problems. It’s everything. Michael has done several other documentaries. He does unbelievable work and he has a true love for the business and the careers of professional wrestlers, so I’m honored that he would even approach me about this. We had a lot of great people participating.“Del “The Patriot” Wilkes: The Man Behind The Mask.” is a 3-disc set and you have the opportunity to see people like Stan Hansen, Greg Gagne, Buff Bagwell, Jackie Fulton, Bobby Fulton and guys like that. Also, a Heisman Trophy winner in George Rogers, my teammate at the University of South Carolina. So, just a who’s who of football players and pro wrestling superstars. Michael has put a lot of hard work and effort into it. Our Kickstarter program has just been phenomenal. We had an original goal of $3500 and we reached this goal quicker than any Kickstarter campaign Michael has had. And we have gone far beyond the goal of $3500. Any and every penny over the $3500 went into this project to make it even better. We were originally going to do only a 2-disc set, but now, because of the extra money that we have gotten over our goal, we were able to include a third disc. All of this money that the fans have donated has blown me away! It has been phenomenal and I appreciate each and every one of you who have donated. I thank every one of you who have taken a part in this and donated to help get this product out. We think that it is going to be something that you really enjoy. PWS: I wish your DVD all the success in the world. For you to be able to, with everything you have gone through in life- the up’s, the down’s and everything in between, have this DVD come out- it’s a celebration of all of your accomplishments met over the span of your life and career. It must be such a great feeling for you. THE PATRIOT: It is. We are awfully excited about it. Also, too, it is an opportunity to share the wonderful career [the fans] made possible for me. Because without them, there never would have been a Patriot. There would never have been any of us. So this is an opportunity to share with [the fans] my career, but to also hope that through telling my story, of the hardships and the difficulties and the ability to overcome that and come out the other side and be able to live the kind of life I live today. I also hope that my story will help someone else. Obviously, there are other people out there struggling with addiction. Hopefully, my story can encourage them and tell them, “Hey look, you can overcome this! You can do this! There is life after this!” We hope more than anything else that it will be a help to people. PWS: Me too. If your story can change one person’s life, then everything you have gone through is worth it. What is Del ‘The Patriot’ Wilkes up to today? PWS: So tell me, what are you up to these days? Del: I’m still in my hometown of Columbia, South Carolina. I’ve been in the automobile industry for the last ten years. I’ve had a wonderful time doing that and a very good career. I’m enjoying my family, my mom, my sister, my children. Just living life and enjoying my family, living a life of sobriety and being clean. PWS: Good for you. You deserve this rest now, being able to sit back and be with your family in your hometown. Do you watch the current product? Del: I watch it, but not a lot of it. I tip my hat to the men and women who make a living in that industry. I know what they’ve been through. I know the hard work, the sacrifices and the dedication that it takes. So, I’m a big fan of those individuals. I’m just not a big fan of the product. And I know that they have very little to do with that. That’s going through the people who work on the creative side of the business and through Vince and stuff like that. But, just not a big fan of the current product. I do watch it a little bit, but not an awful lot. If I want to see what I consider real good stuff, I just pull out some of the DVD’s I have throughout my career and even stuff before my career. Just some of the old stuff I really enjoy watching. 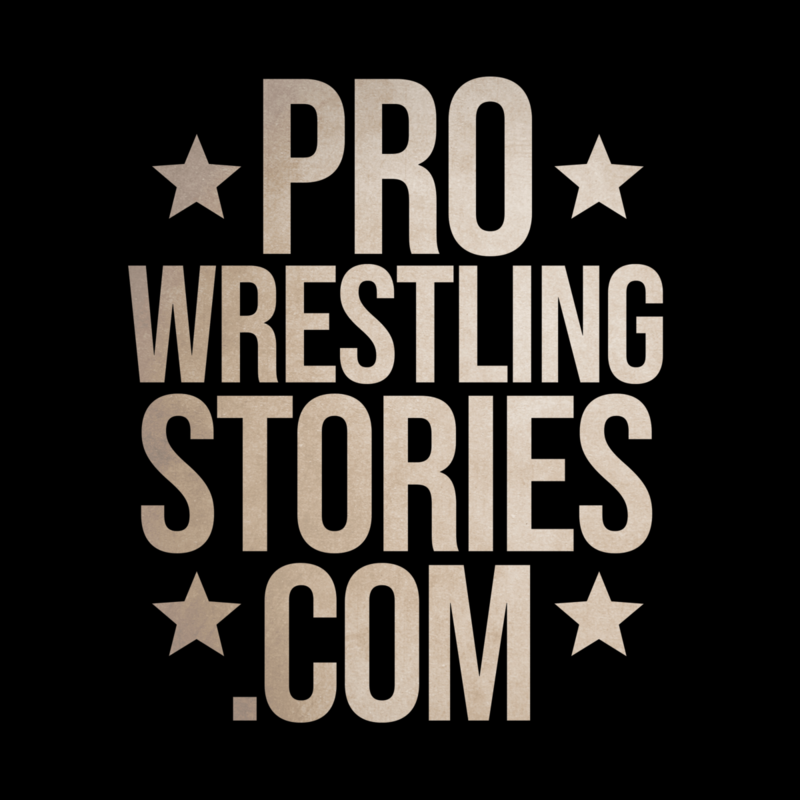 PWS: What advice do you have for young wrestlers coming up in the business right now? Del: It can be done the right way. There was a large number that did get involved in prescription and other recreational drugs and alcohol. There was also a number that did not do that, so it can be done the right way. This is your body. It’s what makes you a living. It’s what provides you the opportunity to live out your dream and to live it out on a high level, on a stage where the world’s watching. So take care of that body. Just taking the bumps night after night and the travel schedule, you don’t need to be putting anything into your body. You don’t need to be putting anything into your body that’s going to make it tougher, so it can be done the right way. If one guy can do it the right way, then everyone can do it the right way. I saw enough of them do it that way, that did not fall victim to that cycle of drugs and prescription medication. Your body is your money maker, take care of it. Preserve it. PWS: That is the standard to achieve and to follow. Del, I want to thank you for spending some time with Pro Wrestling Stories today. It has been an absolute pleasure. I wish you all the very best with the release of your documentary, “Del ‘The Patriot’ Wilkes: The Man Behind The Mask.”And I hope that your story will continue to inspire others. Del: I appreciate you having me. I thank you for the opportunity to talk about this project and the DVD’s that will be coming out soon. I also once again want to thank all the wrestling fans that have contributed to the Kickstarter program that has made this possible. PWS: You take care of yourself. Del: You too, thanks for having me. *A note to publications: if you are going to use excerpts from this interview in a piece on your site, please kindly cite your source by linking back to this article. To hear this exclusive interview with The Patriot in podcast form, click here! Ask PWS: "How Insecure Are Professional Wrestlers?" 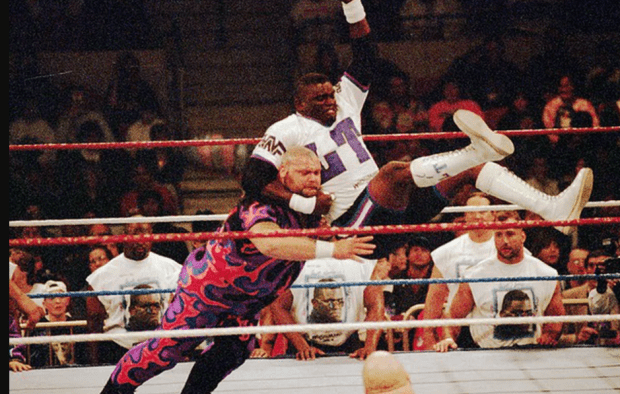 ASK PWS: "Why wasn't BAM BAM BIGELOW Seen As A Main Eventer?" ASK PWS: "Which Wrestler Had the Most Wasted Potential?"